“Students come with an irresistible quest for what is fair and just,” said Damian Parr (Kresge, ’00, environmental studies/agroecology) as the Sustainable Agriculture Education Association (SAEA) held its sixth national conference July 29-31 at UC Santa Cruz. Parr, an education coordinator at UCSC’s Center for Agroecology and Sustainable Food Systems (CASFS) and the conference’s lead organizer, featured students throughout the conference program, giving examples of how they advocate for social justice, nutrition security, and food equity. Included was the premiere of a music video by David Robles (Cowell, history, ’16) about how students create community through farming and food systems. The film was made with the support of the University of California’s Global Food Initiative, a system-wide effort across the 10 UC campuses to address how to sustainably and nutritiously feed a world population expected to reach 8 billion by 2025. Sustainability begins by students being leaders, said Robles, a 2016 GFI fellow. Each year, several undergraduate and graduate fellows are selected on each campus to work on food-related projects. Robles said the intention of the video is for people to learn to take initiative. He wants students to collaborate on their campuses. Community gardening, composting, recycling, and student-driven initiatives such as the Real Food Challenge and the Food Systems Working Group are featured as ways to get involved. 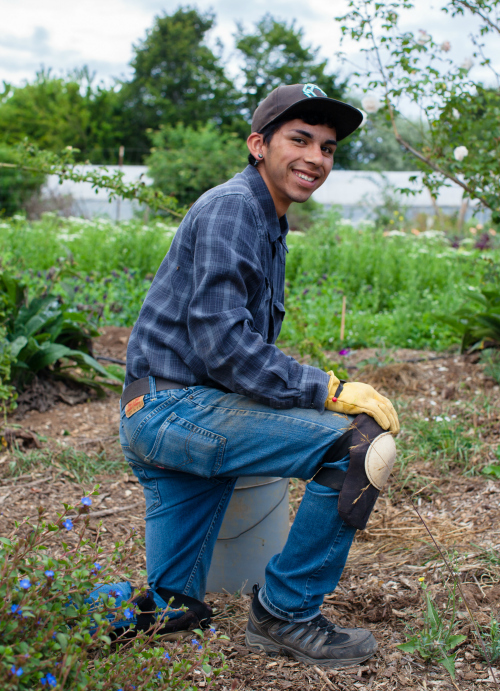 “The work around food systems really has the opportunity to bring people together and facilitate collaboration,” said Robles, who has worked as a farm assistant at CASFS since his freshman year. He is finishing his degree this summer and will work for the youth empowerment and food justice organization “Food, What? !” in the fall. He is also applying to be an apprentice in CASFS’s Ecological Horticulture program for spring 2017. Robles’s video was one in a series of GFI-supported films shown at the conference. SAEA attendees were invited to see films from five other UC campuses that center around food systems and sustainability at their school. Included was a short movie about a sustainable grocery store managed by UC Berkeley students and a story about plant breeding at UC Davis. “Food is the centerpiece of coming together,” said Carlos Lemos, a UCSC student in the Social Documentation Program and producer of another GFI-supported film shown at SAEA. Lemos focuses on the CASFS apprenticeship program and how social justice is linked to food systems. “A student can challenge an entire system,” said Tim Galarneau (College Eight, psychology and community studies, ’05). Galarneau, who leads community-engaged education at CASFS, should know. Since his undergraduate years he has been instrumental in advancing the UC’s commitment to make food services healthier and sustainable. He co-chairs the GFI’s Food Access & Security subcommittee. In addition, he co-founded the Real Food Challenge, a nonprofit that leverages the power of youth and universities to create a healthy, fair, and green food system. As part of the SAEA’s program, Galarneau chaired a panel about achieving food security and sustainability on college campuses. Panelists featured students from groups Galarneau is deeply involved with, including the UCSC Food Systems Working Group, the Real Food Challenge, and GFI’s food security program. Included in the panel was current UC Santa Cruz undergraduate student Ellen Stone (College Ten, environmental studies, ’17), a member of the UCSC Food Systems Working Group and leader of the Real Food Calculator project, a tracking system that assesses the standard of food purchases made by UCSC’s dining services. The tool considers whether products and vendors are local and community based, humane to animals, fair to workers, and ecologically sound. “The Real Food Calculator is about making the food system transparent,” Stone said. Researching and analyzing the supply chain was not easy, she said. She found that suppliers and sales representatives often did not want to speak with students, and that it took persistence to get the information they needed. As Galarneau and other participants at SAEA emphasized, students are critical to creating a sustainable future. In addition to Robles, Stone, and Lemos involvement at SAEA, other UC Santa Cruz student presenters included Katie Monsen, a Ph.D. student in environmental studies and Ryan Duncan, an undergraduate in the department, who spoke about building a student leadership program and ways to improve production management on the campus farm. Monika Egerer and Hamutahl Cohen, Ph.D. students in environmental studies, hosted a workshop about incorporating research-based teaching methods into an agricultural curriculum. Cohen is also a 2016 GFI fellow.